i'm having a pretty tough month thus no blogging. Just thought i'd post a pic of my three girls in their new chariot. Unfortunately for Emma she doesn't want to walk so gets squished into the front on the floor. Fortunately for me it's really easy to push!! 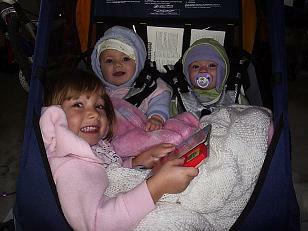 When we were getting out this was divine to take all 3 out for walks in. As you can tell kate on the left is taller than maddie. Still 5 lbs difference. Maddie is ahead in her teeth count though. Up to 4. Emma I believe has all of hers! !